heres a synposis of the series and the opening theme vid. well anyone know who or what company made this series? anyone seen this series yet? i think its a remake of an atv series called Heavenly Ghost Catchers. I've seen the first 27 episodes of this series already, and I hope it's not finished yet, how many episodes do you have available for the show at your video store? The stories revolves around Zhong Kui like the ATV one, but they are not the same. If my memory is not failing me, the ATV one or actually is it Singapore[?] shows the back story and what happens after his death. There are some love stories too, but not the same as the ones that are in this version. Oh, I can't see the first link. The ENTIRE series is on megaupload really?? my store also has 27 episodes, i just bought it and now on episode four. the actors/scenery/cgi are nice. like you said i can't believe theres not much people that seen this series. so far i'm enjoying it since its some new god series besides same ones being remake like monkey king. so the series is divided into like chapters or different arc having different story like in dark tale? in the ending theme it shows zhong kui having some love scenes or dressed as a normal human being and with his scholar friend, which i would assume is before he became a god/ghost catcher. is that part in the series? my dvd started off about the fox demon stealing some officials heart, then comes back for revenge or something. and then it shows bobbys character and his brothers, it felt like there should've been some more back story to how he became ghost catcher or something but is that how the series starts off? this site has stated its 50 episodes while the dvds we have are up to 27, so like you said we should get the other half once its get dubbed in cambodian. 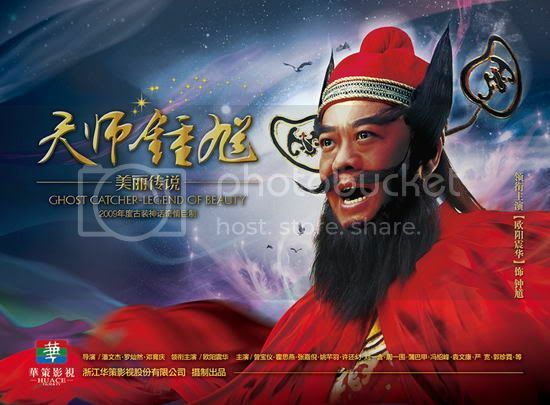 also the first link of youshare has links to megauplaod to download the series i think its also in mandarin, but its the complete series so if you understand it go ahead and watch the second season it probably will explain how zhong kui became the ghost catcher etc. anyone happen to have the ending theme song? Yup, that's exactly the same way the story starts for me;with the story of Su Da Ji and Bi Gan's heart. They are assuming that we know the story of Zhong Kui already or at least familiar with his red/black face LoL. Probably, we will get to see Zhong Kui's back story with the second arc. I really want to see it since I think his martial brothers are really funny, especially the "dumb" cute one. The part in the series where he's riding on a wagon with his scholar friend is NOT in this part. Epic Fail, I know. I love the ending song, but I don't know where it is. There are a lot of handsome actors and beautiful actresses in this series. The first story is really sad and touching. The second story is touching also but the nature of Green Snake makes it really funny. The last story is probably the most romantic but I thought it was quite draggy since I don't care for White Peony and was rooting for Purple Rose [lovely Xiong Nai Jin]. yeah so far the story is good. second tale with green snake and zhong kui bet about love in the mortal world. the 3rd brother and green snake is funny. just hope we get the 2nd season dubbed soon so i can watch it all this week. well so far watch all 27 episodes, basically last episodes ends with zhong kui going to reincarnate, so i guess thats probably the part we will see when he is with yan kuan. can't wait for the next part to come out soon. Btw, I think complete DVDs are out in SG. Last edited by limeic; 06-10-10 at 10:24 PM. oh my goodness, thanks limeic! much appreciations! no i didn't fast foward. schools out so just sat home watching the movie 24/7 toke less then a day and a half. just can't wait for the next part. so is this the company that does those series with hu ge and li shi shi? That should be another company, Tang Ren (I think). can someone tell me what happens in part 4? at the beginning i saw a person called "zhai zen" (sorry i cant spell his name), is he the earlier life of zhong kui? Hmm. Seems like you must ask someone who understands the original language. Personally, I watched the dubbed version, so we didn't get a part 4. Unfortunately. Zhong Kui is "Zhou Fu Sheng's" earlier life. So I don't think that he is "zhai zen" or the other guy the devil was after. The tricky thing here is the painting of "Nie Xiao Qian". What was the relation between "Zhou Fu Sheng" and "Nie Xiao Qian"? I have watch the first story, eventhough I didn't quite understand mandarin. so, is Da Ji (not the nine tailed fox) reincarnated as Su Mei Niang or she just happen to have the same face? HR is the Beauty; GJ, the Beast?